H.O.P.E. 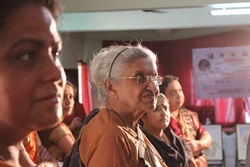 works for social transformation by educating and enabling women and children, facilitating their skills and intervening in crisis situations and social grievances. H.O.P.E. stands by old, young, weak, or helpless human beings when their own capacities are not sufficient or when immediate help is needed. The source of many personal grievances are injustice, social imbalance and indifference. H.O.P.E. fights against the underlying reasons by creating awareness and by means of non-violent resistance and social action. Man should not walk ahead of woman, woman not ahead of man. H.O.P.E. is committed to gender equality and women’s dignity and cultivates this consciousness in all its projects. H.O.P.E. is committed to the protection of the environment. It treats the natural resources it uses itself, judiciously, includes the attitude of environmental protection in its programmes and participates in activities to keep the ecological balance. H.O.P.E. is autonomous and solely committed to the social goal of transformation through education. Within the framework of its activities, H.O.P.E. proactively seeks sources of steady income and project-related funding.